Spinach is a leafy plant which was first cultivated for medicinal purposes. Originating in Iran it soon found its way into Africa . From there it spread to Europe and now it is cultivated all over the world. Spinach prefers to grow in a cool garden but will grow in most climates. If the weather is too hot for the spinach plants they go to seed. 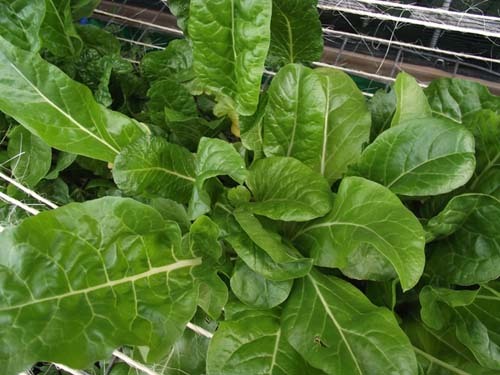 Normally spinach is planted as a spring crop but you can plant it into early summer as well. In South Africa the planting time is from August till April. Spinach requires temperatures of between 2 and 30 degrees centigrade to germinate, with the optimum temperatures being between 7 and 24 degrees celsius. Watering the plant is most important. It needs a constant supply of water and the ground where it is planted should not be allowed to dry out. Good drainage is also required to grow a successful crop of spinach. Farmers would normally plough their fields to a depth of 20cm and then harrow the soil and level it. For the home gardener turn your soil to the depth of 20 centimetres with a spade and then harrow and level the soil, preferably building in a slight slope so that once your spinach plants have germinated you can water the plants at the one end of your bed and the water will cascade down to the other plants. Make small trenches across the bed using the slope from high to low so that when watering the water will flow along the trenches and water the seeds planted in them. Spinach seeds should be planted directly into the ground in the trenches mentioned above. When planting place the seeds about 15 to 20 centimetres apart and bury the seed about 20 millimetres underground. If the soil is light 20mm is the correct depth, if you have heavy soil then you should sow the seed closer to the surface. In heavier soil the germinating seed will struggle to reach the surface hence the shallower depth of planting. Spinach seeds will take about three weeks to germinate. If you want more than one crop of spinach per season you should plant a batch of seed every three weeks to ensure a continual supply of spinach. When you have planted your seed you should water the seed until the soil is moist. You can use a sprinkler on the spinach bed until the spinach has germinated. Once the seedlings appears above the ground water the seedlings using running water in the trenches. Spinach leaves are susceptible to diseases if the leaves get wet so under leaf watering should be the order of the day. Spinach should be fertilised at least once a week with a dose of nitrogen rich fertilizer which should be watered into the ground. The fertilizer boosts the growth of the leaves. Spinach is susceptible to blight which results in the leaves of the spinach turning yellow and curling up. Other diseases such as downy mildew, leaf miners and mites could also be a problem. Spinach takes about 10 weeks to grow to maturity. The leaves are edible anytime from the time they germinate so you can pick them at any time. After picking and before use wash the leaves carefully to clear out any dust or mud which may have stuck to the leaves.